The L.A. County Community College District just landed a big grant from the state to help train students that could end up building (and rebuilding) our next generation of infrastructure. If you’re interested in a transportation career (and even if not), watch the video of Phil’s remarks that Joe Linton posted. “I can’t think of a better industry to get into than transportation,” Phil says, pointing out the number of lives touched by helping people get around. And there’s this: Metro has an aging workforce in many quarters and there should be an increasing number of jobs for younger employees in the coming years. Metro’s strategy overcomes this challenge by taking a do-it-yourself, open-source approach to infrastructure development. The strategy is essentially a guidebook that cities, community groups and businesses can follow according to their own needs, timetables, capacities and — perhaps most importantly — budgets. Metro is currently pursuing pilot projects. Generally, there is no master plan or timetable, and Metro will accept implementation as it comes — hopefully sooner rather than later. Metro officials are promoting these strategies in the hopes that partners will see their wisdom and jump on board. 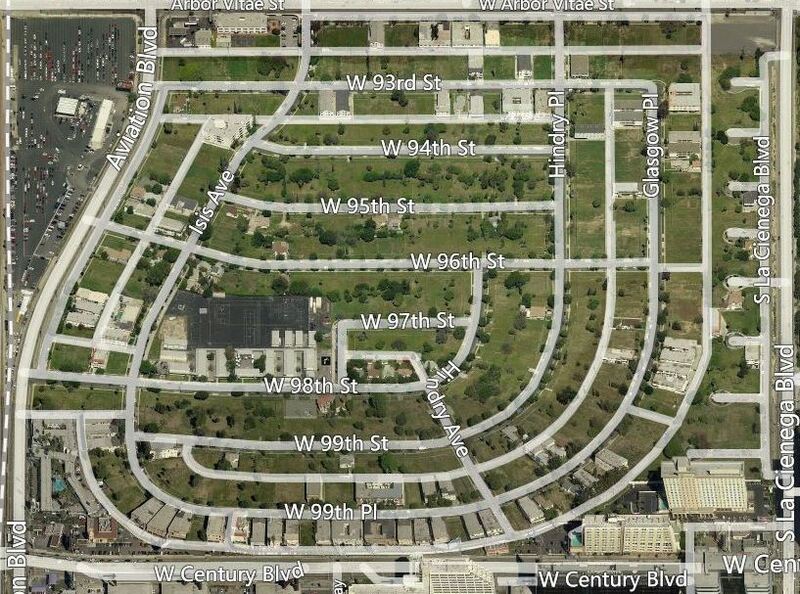 In essence, anyone can now be a transit planner in Los Angeles. In fact, Metro’s strategies may apply to plenty of other cities around the region and around the country. Metro finished a first mile/last mile strategic plan last year. Generally speaking, it’s a technical document filled with various strategies to make it easier to get to key transit stops/stations. I think it’s great that Metro drew up a plan because first mile/last mile is a serious hurdle that I think prevents some people from taking or trying transit. Hopefully cities that benefit from existing or new Metro projects take the issue seriously, too. 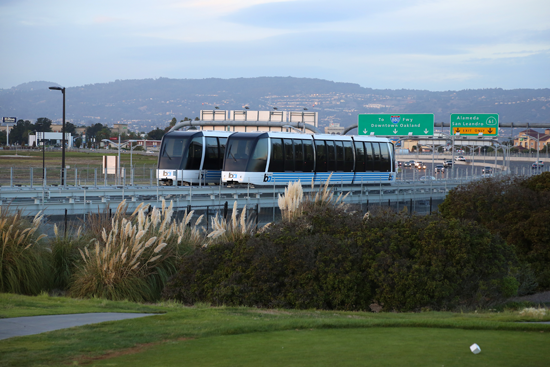 The people mover that connects Oakland’s airport to the regional BART rail system. Photo: BART. After years of talk and delay, LAX is finally poised to begin design and construction of a people mover system that will connect to the Crenshaw/LAX Line at Aviation/96th Station. It’s a very high priority project for L.A. Mayor Eric Garcetti, who nominated Flint for the job. Tru Sound. Photo: Zocalo Public Square. 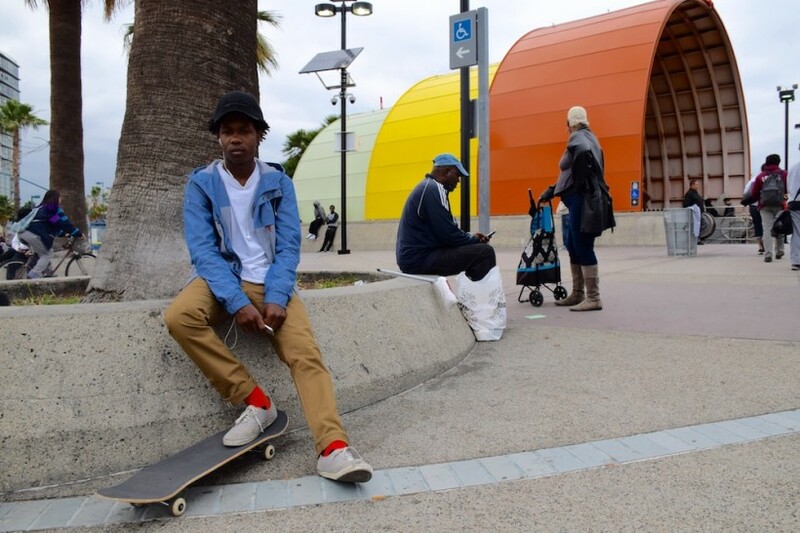 The latest Metro rider profile by Zocalo Public Square. Houston METRO is about to overhaul its bus network to better emphasize high frequency transit corridors. Transportation planner Jarrett Walker mostly likes their online trip planner which not only provides transit directions — but compares transit trips on the current system to the new one. So of course I tried it and clicking randomly — I’ve been to Houston exactly once in my life — managed to find a trip that will take longer on the new bus system. Whoops! Of course, bus system overhauls don’t always result in faster trips. The idea behind them is to better concentrate and simplify service so that it’s more predictable and that more people will ultimately want to use it. Bus network overhauls have been in fashion in the transit world in recent times. The key question is whether that will happen here at Metro, which has a sprawling system that serves many parts of the county. The system can also be confusing for newcomers with many routes running on a wide variety of different streets between far-flung cities and communities. Click above to visit the Houston METRO trip planner. Of course, 1,600 miles is a lot of miles. Will they actually build all those bike lanes? Well, they call it the Busy Bee State for a reason. It’s great that the construction for the people mover is about to begin and LAX is finally getting a transit connection that it deserves, but how are they going to start construction when they haven’t seemed to have demolished the area where the CONRAC is supposed to be at? The CONRAC is supposed to be built in the quadrant bordered by Aviation, La Cienega, Arbor Vitae and Century. Looking at the aerial satellite view and my frequent trips to LAX where I pass by this place all the time, there still are homes, apartment complexes, hotels, restaurants, a school, and gas stations there that have yet to be bought out and demolished. I have to imagine that is one very costly and time ensuring endeavor to buy out all the properties from the land owners, negotiate terms (undoubtedly, the hotels will ask for a lot of money because they’re sitting on prime land in the hotel corridor close to LAX), relocate tenants living in the apartment buildings, and demolish them. Where will the kids that go to this school go if this school is demolished? How cares knock everything down. just build it. Because you can’t just “knock everything down” and “just build it.” It’s called the just compensation clause of the Fifth Amendment.